Disclosures Outline The Wealth Of Ivanka Trump, Jared Kushner, Steve Bannon, Michael Flynn : The Two-Way As members of Trump's staff disclosed their financial assets, new details have emerged about the wealth of Ivanka Trump, Jared Kusher, Steve Bannon, Gary Cohn and former adviser Michael Flynn. Jared Kushner and Stephen Bannon in September 2016 in Canton, Ohio. Financial disclosures from members of the Trump administration are revealing the extent of their wealth and much of where it comes from. Beginning on Friday, the White House said it would make available roughly 180 financial disclosures for White House officials. It begins to paint the picture of just how the Trump administration is the wealthiest administration ever. In 54 pages of a financial disclosure, President Trump's son-in-law and key White House adviser Jared Kushner lists assets and debts owned by him and his wife, Trump's daughter Ivanka. Pages and pages are devoted to the family's massive real estate investments. The couple has emerged as influential advisers in Trump's White House, unpaid to avoid triggering anti-nepotism rules. Kushner was cleared for the job in January, while Ivanka Trump announced this past week that she would assume an official role. Friday's financial disclosures show that Trump's daughter and son-in-law have assets valued at more than $200 million. According to the The New York Times, they "will remain the beneficiaries of a sprawling real estate and investment business still worth as much as $741 million, despite their new government responsibilities." The documents show Kushner divested dozens of businesses and investments to avoid conflicts of interest with his public service. He has also resigned from more than 260 posts at various organizations and corporations. According to the AP, Kushner's lawyers, "in consultation with the Office of Government Ethics, determined that his real estate assets, many of them in New York City, are unlikely to pose the kinds of conflicts that would trigger a need to divest." In the documents, Ivanka Trump also reports a stake in the Trump International Hotel in Washington, D.C., with her share valued between $5 million and $25 million. The filing says she made between $1 million and $5 million in profit off this stake in 2016 and part of 2017. Given Ivanka Trump's recent decision to become an official White House employee, her financial disclosures and ethics agreements are expected to be filed later. The Times reports that Ivanka Trump will maintain her stake in the Trump hotel in Washington even as she takes on official government duties. 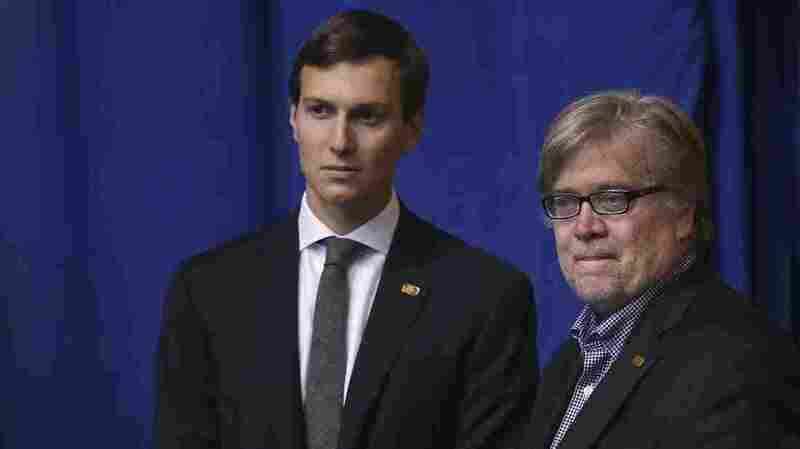 Others disclosures include Steve Bannon, former Breitbart executive chairman and Trump's chief strategist at the White House. Bannon "earned at least $1.4 million in the last year and held assets valued between $10.7 million and $48.6 million when he joined the administration," according to a tally by The Wall Street Journal. Bannon reports income of $191,000 from the right-wing Breitbart News, $125,333 from Cambridge Analytica, which analyzes election data, and $61,539 from the Government Accountability Institute, a nonprofit he co-founded. The three organizations all have links to hedge fund manager Robert Mercer and his daughter Rebekah Mercer, both of whom are active in funding conservative political causes, as The New Yorker's Jane Mayer detailed. "The disclosure suggests that Bannon Strategic Advisors served as an umbrella company for receiving fees he earned from interests in other companies such as Breitbart News, Cambridge Analytica and Glittering Steel, a company that produced the documentary "Clinton Cash," on which Ms. Mercer served as an executive producer, as well as ads for Republican candidates." Gary Cohn, the National Economic Council director who is a former Goldman Sachs president, is one of the wealthiest members of Trump's team. He reported assets worth at least $254 million and income of at least $48.3 million over 2016 through early 2017, according to Bloomberg. Cohn lists his 2016 salary from Goldman Sachs as $1.85 million with a cash bonus of $5.74 million from 2015. Adding in dividends and interest from Goldman-affiliated assets, Cohn made at least $40 million from the organization, according to the AP and CNBC. He made more than $1 million — there are no details of how much more — from dividends from the Industrial and Commercial Bank of China. On Saturday, the White House released two forms detailing the assets of former national security adviser Michael Flynn. The first, electronically signed by Flynn on Feb. 11, did not include details of payments he received from organizations linked to Russia. Two days after that, he resigned as national security adviser after reports emerged about his meeting with Russia's ambassador and his misleading of Vice President Mike Pence and other officials about the meeting. The second form, signed by Flynn on March 31, lists "speaking engagements" with RT TV, the Russian government-backed news network, cybersecurity firm Kaspersky Government Security Solutions, Inc. (the parent company, Kaspersky Labs, has underwritten NPR), and Volga-Dnepr Airlines. The payments are in the section labeled as "sources of compensation exceeding $5,000 in a year." Last month, NPR's Jackie Northam reported that Flynn's income from the three organizations totaled more than $50,000, as detailed in separate documents released by congressional Democrats. Flynn lists an income of at least $1.37 million on the more recent disclosure. Of that, he made $827,055 from Flynn Intel Group LLC, his consulting firm, which has been "inactive" since December. The disclosed documents provide a snapshot of each appointee's holdings as they took office. Many of the records showing subsequent divestitures or resignations will be released later this year. The White House says some appointees are still in the process of divesting assets. Typically, appointees in a new administration hash out their financial agreements and divestitures before assuming public office. However, the Trump administration has announced a number of appointees before these negotiations took place. Data from the Office of Government Ethics has shown that compared with the Obama administration, the Trump White House has been much slower to submit its nominees' financial arrangements for review by OGE. As Trump has appointed numerous hyper-wealthy individuals, the White House points out that its ethics lawyers have been working through highly complex financial arrangements. Estimates for the cumulative wealth of the Trump Cabinet by various media organizations have ranged from $6 billion to $14 billion. The release of the financial disclosure forms is in compliance with a federal ethics law that requires high-ranking executive branch appointees to disclose their financial holdings and reach agreements with ethics officials. These agreements aim to ensure that none of the appointee's holdings conflict with his or her duties. Often, the agreements require a sale of assets, resignations from posts or recusals from handling particular matters. The president and vice president, as elected officials, do have to file financial disclosures, but at a later time. The two of them are also exempt from many conflict-of-interest and ethics laws that apply to their staff. NPR's Peter Overby and Tamara Keith contributed to this report.